Aleuria aurantia or orange peel fungus is quite a striking sight in late summer and autumn. 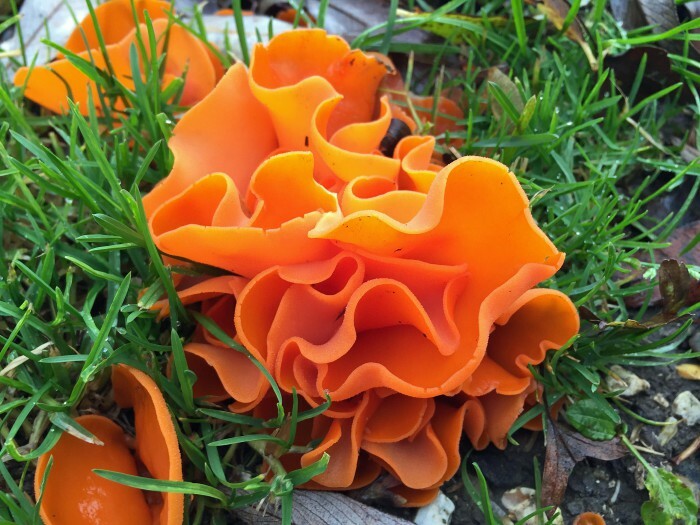 Our very damp weather conditions have encouraged it to reveal it’s fruiting form above ground and indeed it does look like discarded orange peel, very bright and vivid orange. Orange peel fungus. (Aleuria aurantia). A rare sight in the UK. Generally this fungus grows around dead trees where the soil is compacted or has been recently disturbed. The striking beauty of this mushroom attracted Christiaan Hendrik Persoon (1755-1837) to study fungi. Persoon is now regarded as the father of systematic mycology.